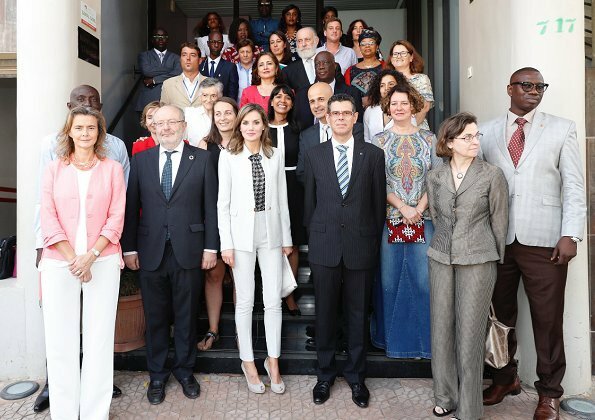 Queen Letizia of Spain visited the Senegalese Red Cross office with first lady of Senegal Marieme Faye Sall on December 12, 2017 in Dakar. 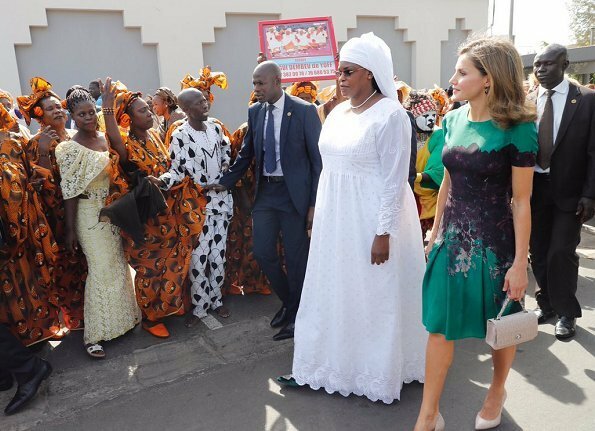 White is a good colour for Senegal. And green.It 's fantastic that she recycles her clothes and connects that with different accessorises. I like the white suit - good colour for the tropics and very chic. I don't like the dress, I didn't like it last time. It looks like she's thrown a massive pot of ink all gown herself. Todo muy adecuado. El traje blanco es perfecto para África y el verde ideal para un almuerzo. Me gusta mucho el movimiento del vestido, es una seda magnífica. I love that business loook. I don't like the dress or the trousers, too short and too tight! Capri style pants should be worn with flat shoes, Audrey Hepburn style, otherwise they look ridiculous in my opinion.